Israeli PM Egghead Omlette has told the US he wants Iraqi dictator Saddam back in charge of Iraq. Running Iraq for the Yanks and Israelis? 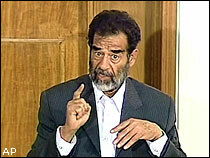 "Last time Saddam was in charge he invaded Iran; let's get him to do it again and save us the trouble!" Iranian Dictator Madmanahmed was unavailable for comment.